With the influx of visitors, it seemed appropriate that Shanksville, like the World Trade Center site and the Pentagon, would get a September 11 memorial. It turned out this was no simple task: Building the Flight 93 National Memorial, which opens on September 10, turned out to be, in some ways, every bit as challenging as the projects in New York or Washington. True, the people behind Shanksville’s memorial didn’t have to wrestle with the Port Authority; they didn’t have to balance the demands of building in the Pentagon’s shadow. But they did face conspiratorial bloggers, a hypocritical congressman, at least one avaricious landowner, and several layers of well-meaning bureaucracy. More than that, though, they faced the challenge of doing it all in a small town that still isn’t comfortable with the role forced on it by history. SHANKSVILLE is a borough on a hill, with three parallel streets (the fire station occupies the highest one), three churches, and a one-building K-12 school. Families stay here for generations-Glessner can trace her genealogy back to Christian Shank. Outside town, cars share the road with Amish buggies, ATVs, and combines. People work in mining or farming or construction, or they drive to bigger cities like Somerset (population 6,277) and Bedford (population 2,841). Most need to supplement their income, and many farm houses and mobile homes have hand-painted signs advertising firewood, antiques, and pick-your-own blueberries. All of this is to say that the region is poor, rural, and very independent. This last quality drove Shanksville’s initial response to Flight 93. In the weeks after the tragedy, the local government paved a small parking lot on the side of the bowl-shaped meadow where the plane had crashed, and erected a 40-foot chain-link fence where people could leave messages and mementos. Glessner watched the growing activity at this temporary memorial, until, one Sunday at church, she suggested starting a group of volunteer guides. That first winter, the Flight 93 Ambassadors sat in their cars to keep warm while waiting for visitors. In December, Shanksville and Somerset County also hosted a meeting at the school to discuss building a permanent memorial. But not everyone in town welcomed the attention. Rick King, who owns Ida’s Country Store, the only place to get a meal in Shanksville, remembers the constant interruptions from tourists needing directions and reporters needing local color. “You couldn’t mow your grass for the first year,” he says. For the first time, parents worried about their kids riding bikes in the street. Neighboring businesses had to put out “NO PUBLIC RESTROOM” signs, because their septic systems couldn’t cope with all the tourists who asked to use the bathroom—although they rarely bought anything. And then the government stepped in. In September 2002, George W. Bush signed the Flight 93 National Memorial Act, authorizing the National Park Service (NPS) to develop a permanent memorial. The NPS proceeded much differently than had the locals. For example, it created a Resource Assessment Committee, which spent more than a year commissioning studies by engineers and economists, compiling a “Cultural Landscapes Inventory,” and developing 3-D computer models of the crash site’s topography. The committee decided that the Flight 93 memorial should include 2,200 acres, which meant a budget of between $30 and $58 million. Both numbers astonished many locals. While the Ambassadors were serving more and more visitors—including tour buses that rolled through Shanksville on their way to Gettysburg or Washington or New York (Glessner counted 180 buses in 2003 alone)—others in Shanksville wondered why the rest of the country wasn’t ready to move on. These frustrations became especially clear when Somerset County conducted a corridor study on the traffic patterns and commercial development along U.S. 30. The NPS had projected that a permanent memorial would more than double annual visits to the site, from 130,000 to a peak of 400,000. The corridor study warned that, since municipalities like Shanksville had no zoning, billboards and chain restaurants could soon pockmark their countryside. But residents used the study to voice their irritation at the memorial itself. “I like things the way they were, before this dumb idea,” read one anonymous comment card. “Why do we have to make changes when we didn’t ask for change?” read another. ON A WEDNESDAY afternoon in September 2005, the NPS held a press conference in Washington to reveal the design for the memorial: a plan by Los Angeles-based architect Paul Murdoch called “Crescent of Embrace.” Murdoch had beaten out more than 1,000 submissions to win the NPS’s two-stage, two-jury competition. The titular feature of his design called for a crescent of red maple trees to curve along the bowl of the Pennsylvania field, framing the crash site. The NPS took his allegations seriously. It circulated Rawls’s research at meetings and asked several professors to review it. (They all rejected his arguments.) The NPS even invited Rawls to Shanksville to talk with Murdoch and several members from the competition’s juries. Rawls was not impressed—“a dog and pony show” is how he described the meeting to me during a rambling hour-long interview—and soon returned to his campaign, poring over the NPS’s Flight 93 newsletters; buying full-page, tiny-type ads in Somerset County newspapers; and even tracking down the home addresses and phone numbers of several family members of the Flight 93 victims in order to plead his case. The Islam-memorial accusations set the NPS back several months. A bigger obstacle, though, came from Charles Taylor, the Republican chairman of the House Interior Appropriations subcommittee. The state of Pennsylvania and the federal government had allocated nearly $32 million for the Flight 93 memorial, in addition to private donations. For two years, the NPS had requested $10 million in federal dollars to purchase the memorial’s land—and, for two years, Taylor had denied the request. So, in 2006, some Flight 93 family members lobbied Taylor in person. Taylor claimed he was taking a principled stand against the project’s excessive price tag, which might have made sense but for the fact that Taylor, to pick only one instance, had previously secured $3.8 million to build a lavish park next to the headquarters of one of his own companies. After pressure from numerous Republicans, including Bush’s chief of staff, Taylor relented, adding the request to his 2007 budget. NOW THAT the NPS had the money for the memorial, it turned to buying the land. The government secured easements on 900 of the acres, but this still left about 1,300 acres—spread out over 13 different tracts—to be purchased. For long stretches, the NPS was preoccupied with obtaining the two most important parcels, which were owned by PBS Coal and Svonavec, Inc. PBS eventually agreed to sell its 900-plus acres for a little more than $2 million and deposit the money in a trust fund to cover the treatment of water that had been contaminated by its mining operations. But buying the land of Svonavec, Inc., a locally owned quarrying company, proved more complicated. After the Flight 93 crash, the Svonavec family had graciously allowed the construction of the temporary memorial on its 273 acres. As the negotiations stretched on, though, the Svonavecs became less cooperative. At various points, the Flight 93 families and the NPS commissioned three separate appraisals of the Svonavec land and made offers ranging from $250,000 to $750,000. According to one of the family members, Michael Svonavec claimed the land was “worth $50 million, but you can have it for $10 million”—with $10 million being the highly publicized figure intended to purchase land for the entire project. Svonavec denied saying this. Still, his family seemed intent on squeezing every dollar out of land that for years had sat mostly empty, except for locals who used it to hunt or ride snowmobiles. The Svonavecs hired the same appraiser who’d evaluated the homes of O.J. Simpson and JonBenet Ramsey. In 2007, they installed a donation box at the temporary memorial that promised, “Your donations go directly to securing and preserving this site”—then pocketed the money to pay for a private security team. When the NPS found out, its rangers taped plastic bags over the donations box. In 2008, Svonavec countered by refusing to renew the temporary memorial’s agreement, which forced the NPS to move the memorial to the newly-acquired PBS land. In December of that year, the Flight 93 families appealed directly to President Bush, asking him to invoke eminent domain and seize the Svonavec land. ON NOVEMBER 7, 2009, the NPS finally broke ground on the Flight 93 National Memorial. The following summer, construction crews started pouring concrete for the memorial’s features and building the new road that would connect them directly to U.S. 30. Despite the many delays, the NPS finished on schedule. By the time I visited, for three days in late July, the memorial was more or less complete. In Shanksville, tourists were still asking for directions—GPS doesn’t work well there—then moving on. Of the six obviously commercial buildings in town, two sat empty. Some people remained frustrated by the memorial; a few who lived within a couple miles had yet to visit it. “There are places I don’t like to wear my Ambassadors shirt,” Glessner told me. Even people as enthusiastic as Glessner could seem weary of the whole affair. In our first conversation, I tried awkwardly hinting at the questions I knew she’d answered a hundred times. “Are you asking me for my 9/11 story?” she finally said. I also got used to seeing residents tense up at the sight of a reporter’s notebook. One day, I talked to Rick King, the owner of Ida’s, at some length about the town and how it had been changed by the United 93 crash. Later, I mentioned King’s name to a local fireman, Brad Shober, who told me that King had been one of the first people at the crash site. I later asked King why he hadn’t shared this. “I get a little bit wary of telling that story again and again,” he admitted. Alec Rawls continues his war on the memorial—and has been joined by Tom Burnett Sr., whose son was one of Flight 93’s most prominent victims. Rawls plans to run more local newspaper ads during the memorial’s dedication. Burnett is refusing to attend the ceremony and has asked that his son’s name be removed from the memorial, though the NPS has declined. Because of slow fund-raising—the project is still $10 million short of the $30 million in private donations it needs—several parts of the memorial remain on hold, including the ring of red maples that first provoked Rawls and others. Well, once the permanent memorial opens, you’ll be able to pull right off U.S. 30, which now has turning lanes, and walk from your car through acres of wetlands full of lolling ducks, past trees so new they’re still in their green plastic water bags, out a long and somber slate path to the memorial’s plaza. There, a wall made up of 40 granite panels, each engraved with the name of a Flight 93 passenger or crew member, will trace the plane’s flight path. At that point, you’ll be 200 yards from where the plane crashed. To your right, a recessed gate will lead to a second, private path where family members can walk out to the tree line. 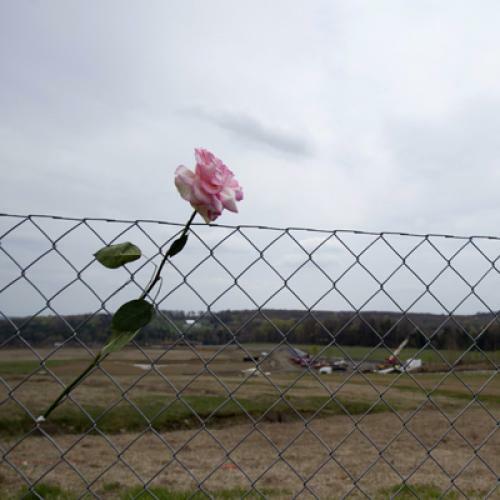 For them, the Flight 93 National Memorial will always be part monument, part cemetery. For the rest of us, it will become part of 9/11’s transition from a personal experience to a historical one. Indeed, standing there, surrounded by Pennsylvania hills still muddy from construction, you feel the site’s power coming not only from what happened, but from its utterly arbitrary location—in a place history, to that point, had mostly passed by. Craig Fehrman is a Ph.D. student in Yale’s English department and a freelance writer. This article originally ran in the September 15, 2011, issue of the magazine.